Blackjack Hall of Fame was established in 2002 for honoring the most famous and successful blackjack players, authors and experts. It is housed in San Diego, California in the Barona Casino. 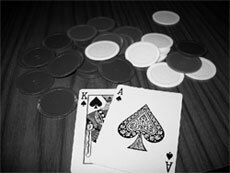 At first 21blackjack gamblers, authors and experts were nominated for the membership. They were chosen by the Internet voting, which lasted for a month. It ended in January 2003 at the Blackjack Ball. On that event the 1st seven members of Blackjack Hall of Fame were inducted. During the next 2004 year 2 more members were added. Al Francesco (the year of 2002). He is one of the blackjack teams concept founders. Peter Griffin (the year of 2002), the author and the theoretical pioneer of "The Theory of Blackjack". Arnold Snyder (the year of 2002), the author of the Blackjack Forum and its editor. Earlier was he was very successful professional blackjack gambler. Edward O. Thorp (the year of 2002), the author of the "Beat the Dealer" book and the father of the blackjack card counting system. Ken Uston (the year of 2002). He is a professional gambler and the author of the group counting technique. Stanford Wong (the year of 2002), he is the author of the Wonging blackjack strategy. Tommy Hyland (the same - 2002) blackjack team manager (one from the longest-running). Max Rubin (the year of 2004). He is famous for the optimizing of the casino comps and gambling events media reporting. Keith Taft (the year of 2004), the inventor of hidden computerized devices. Julian Braun (the year of 2005), the blackjack author. He used computers for blackjack statistics analysis. Lawrence Revere (the year of 2005), famous blackjack teacher and the "Playing Blackjack as a Business" author. James Grosjean (the year of 2006), the author of "Beyond Counting", professional player and the computer analyst. John Chang (the year of 2007), in past the MIT Blackjack Team manager. Roger Baldwin, James McDermott, Herbert Maisel, Wilbert Cantey (the year of 2008) they all are known as "The 4 Horsemen of Aberdeen". They discovered the 1st accurate blackjack basic strategy.